After years of internal work, over a month of public testing—and then even more internal iteration—the biggest update in the history of World of Tanks is nearly upon us! It elevates the game to 2018 standards in graphics and sound with the switch to a completely new graphics engine, Core, and introduces a new authentic soundtrack. The result? The world has been totally reskinned. It has all the bones of the original but a radically different face: crisper graphics, more detailed textures, higher-resolution images, and tunes that are timed and matched perfectly with what’s happening in the game. Better still, we worked a lot on performance optimization, reducing the overall memory footprint of graphics so that everyone can enjoy new visuals. 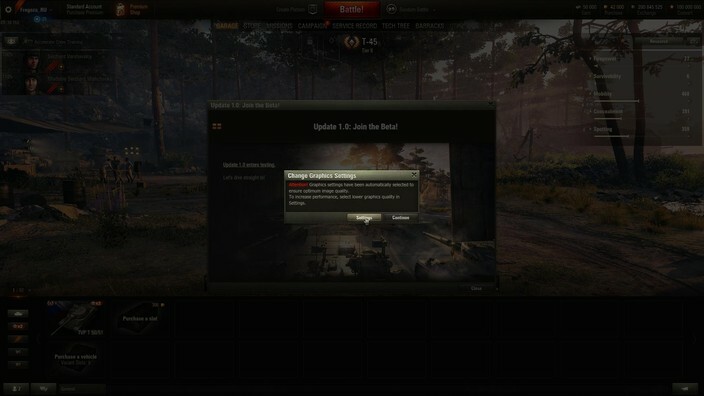 World of Tanks servers will be down 27/03 from 03:00 to 10:00 UTC+8 to get everything in order. With this healthy increase in detail and effects, you're probably wondering what kind of framerates your system will be able to produce. Worry not, we put in extra hours of work to optimize code for graphics and performance, tweaking graphics sub-systems and using streaming technology to reduce the graphics footprint on your rigs. The Core engine uses Virtual Texturing for memory optimization. In basic terms, we pre-calculate all the heavy blending needed to produce a realistic surface, save it as a Virtual Texture, load it in advance and only show it if necessary. Also, we no longer need material blending in the tessellation stage. So we use tessellation without a significant performance drop. We combine Screen Space Reflections with Parallax corrected reflection probes that store pre-computed reflection data. This new approach adds fidelity to the water as we now reflect exactly what we see instead of previously simplified reflections. Most of the shadows are calculated when first loading the map and re-calculated only when the level changes. That gives a great boost in performance and enables correctly illuminated objects even on low-end hardware. 3D scenery covered by the opaque UI elements (the minimap and damage panel) is no longer rendered, which saves on GPU performance. Now track movement is calculated per each track segment (~100 calculations per average tank tread). While increasing performance, this optimization does not affect visual quality. It reduces the GPU load, whilst the tracks display natural and realistic movement. Trees are baked into billboards with all the information including depth and lighting data. Thanks to it, we can switch trees to billboards much closer to the viewer (and you won’t notice a slightest difference!). Level of Detail (LOD) adjustment occurs as smoothly as possible over a short period of time so there’re no jarring transitions between different LODs. This seamless transition doesn’t require extra resources. Now, high-resolution effects are only displayed along the edges, and the interior is rendered in lower resolution. This switch is practically unnoticeable but saves a lot of performance in critical moments. The active zone for light tanks. Thanks to the landscape and terrain, you won’t be left out in the open. But be careful, those pesky tanks might be hiding up by the carrier. Tank destroyer spots. Good viewpoints, often with concealment, and even with a thinly armored vehicle, you can still do some damage. There’s a large number of small shelters that won’t protect you from enemy artillery fire here and bushes. It’s a perfect spot for the mediums and not a bad location for tank destroyers either. In the case of a successful enemy advance to the center, take position on top of the aircraft carrier. By controlling the aircraft carrier, your team can help your heavies break through. Even by locating yourself by the sides of the carrier, you can help support your team in the center. Designated spot for heavies. The perfect place for the heavies to fight, covered from artillery fire, there’s a plenty of options to maneuver amongst the blocks of ice and frozen shipwrecks. 1. The active zone for light tanks. Thanks to the landscape and terrain, you won’t be left out in the open. But be careful, those pesky tanks might be hiding up by the carrier. 2. Tank destroyer spots. Good viewpoints, often with concealment, and even with a thinly armored vehicle, you can still do some damage. 3. There’s a large number of small shelters that won’t protect you from enemy artillery fire here and bushes. It’s a perfect spot for the mediums and not a bad location for tank destroyers either. 4. Tank destroyer spots. Good viewpoints, often with concealment, and even with a thinly armored vehicle, you can still do some damage. 5. In the case of a successful enemy advance to the center, take position on top of the aircraft carrier. By controlling the aircraft carrier, your team can help your heavies break through. Even by locating yourself by the sides of the carrier, you can help support your team in the center. 6. Designated spot for heavies. The perfect place for the heavies to fight, covered from artillery fire, there’s a plenty of options to maneuver amongst the blocks of ice and frozen shipwrecks. If playing a heavy tank, consider the north-west with destroyed ships and a large aircraft carrier stuck in the river of ice. It offers decent protection from arty shells and ample space for maneuvering. Mobile light tanks will feel at home in the central area, where they can leverage multiple open spaces and use their view range to uncover enemy positions and hunt down enemy LTs. Support vehicles can thrive in spawning areas to the south-west and north-east. Use concealed positions and the good viewpoints they offer to wear down enemies and support a push. 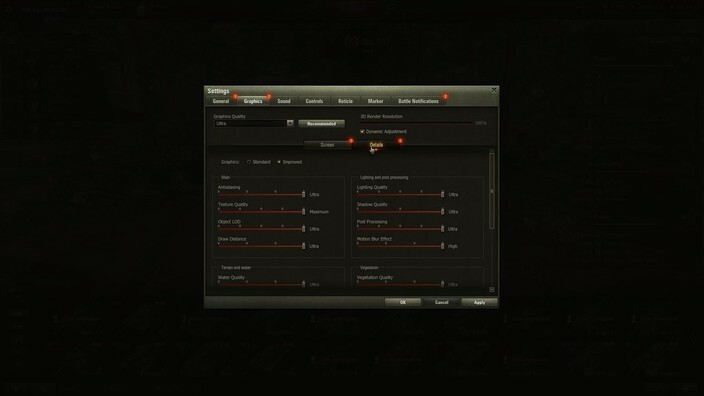 The northern area close to the aircraft carrier and the south-east part of the map are best suited for medium tanks. Secure the spot near the aircraft carrier to help friendly heavies break through or support your team in the center. Graphic configurations get reset with the switch to the new engine, and we’ll help you hit that sweet spot between visuals and performance. Here are a few simple tips to help you with settings. Run auto-detect test: There’s no need to customize the client manually by disabling some settings to improve performance. The auto-tuning system, updated ahead of the 1.0 launch, will do it for you, finding the right balance of performance and appearance for your rig. Run the test to get the preset option that best suits your PC or laptop. Use advanced settings (if you’d really like to): Choose the preset option offered by auto-detect and work from there to adjust the game’s visuals manually in Advanced Graphics Settings: pick Standard or Improved graphics render and tailor the settings to your needs. Some graphics settings are more important than others. Reducing the right settings may get you to comfortable FPS rates without severely reducing the image quality. You should start with special effects—antialiasing, texture and object quality, draw distance, lighting and post-processing. These are taxing, and toning them down can help you boost frame rate. If you want more in-depth explanations on each advanced settings option, check out the complete guide HERE. This is by no means everything that’s been done so far. With this foundational refresh complete, the team will continue with other big improvements including general bug fixing, enriching the roster with new maps, national lines, modes, and more. We are keenly focused on what’s in front of us—an exciting, brand-new opportunity to deliver the ultimate experience for World of Tanks fans past, present and future. For now, check back with Info Hub for a deeper look at each feature jammed into Update 1.0 and hit the battlefield to see the remastered game with your own eyes! Click/tap the images below to see in-depth detail on each feature. Now all foliage reacts to the actions of the player's vehicle: grass and foliage are shaken by shots and made flat by vehicle tracks, etc. This feature will not affect vehicle concealment, since the animation is displayed only on your computer. Implemented a new water processing system with geometrical waves (tessellation) and SSR (Screen Space Reflection) for modeling reflections on water. 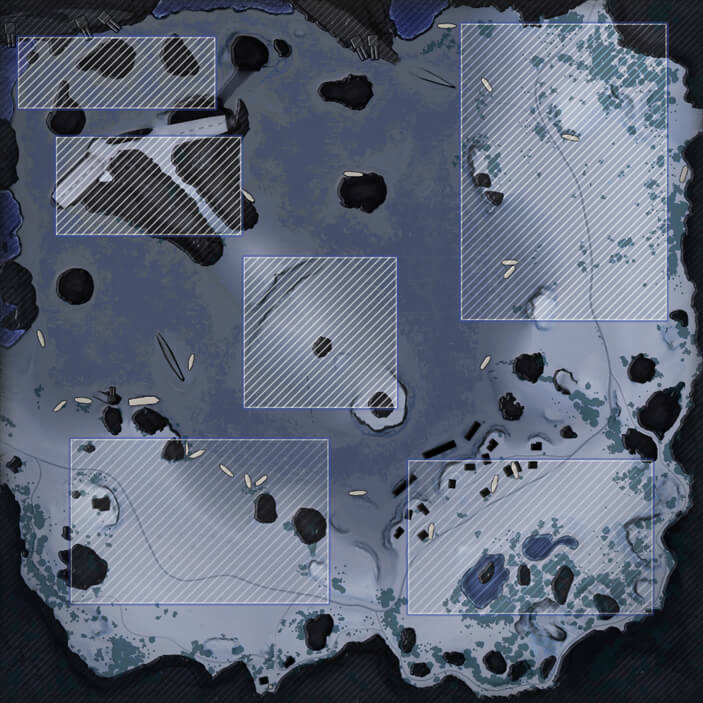 Added the new winter map, "Glacier". Added the "effect of hot air" to all exhaust gases, explosions, shots, and fires. The effect will also be displayed on the hot desert maps along the horizon. The new Garage sounds including the music theme played on the battle queue screen have been added. Completely reworked the ambient sounds of each map. The ambient sounds are rich and natural depending on the map region. Sounds of the player's vehicle (shots, explosions, sound of tracks, etc.) now change and depend on the sub-location of the combat action. The same sound will sound differently in mountains, forest, village, urban area, open field, etc.